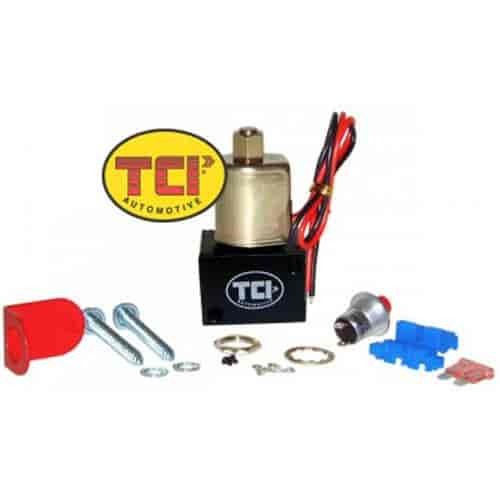 TCI RollStop solenoid is specifically designed to lock the front wheels for impressive burnouts and drag strip staging. The solenoid in each RollStop Kit is designed to operate under extreme heat and high brake line pressures that are associated with racing applications. The Roll-Stop (line lock) kit can be installed ''in-line'' on either the front or rear brakes without brake system modifications. Complete bolt-on kits come complete with a solenoid and a precision micro-switch that releases the front brake and can be installed anywhere in the car. Also includes line, fittings, wire, connectors and everything needed for an easy installation. 861700 is rated 4.0 out of 5 by 1. Rated 4 out of 5 by Roy Buster from Good Quality I am in the process of completing the vehicle for which this roll stop was purchased. At this point I can not comment on performance. But it is fair to say that the roll stop kit is well thought out & appears of high quality. More later! This is made to fit the front brakes of most applications. It doesn't matter whether you have an automatic or manual transmission. Will I have to disable the ABS system on my 2005 g35 coupe to use this? Yes you will need to disable ABS to use this brake control.